Wolfsburg / Geneva, 29 February 2012 – Exactly one year ago, Volkswagen presented the new Golf Cabriolet at the Geneva International Motor Show. Now, at the same venue, the top version of the bestseller is making its world debut: the first GTI Cabriolet in the history of the Golf! The GTI engine crowns the open-top four-seater with 155 kW / 210 PS of power, making it the most powerful Golf Cabriolet ever. GTI does not only mean more power, but also a sportier exterior and interior and precisely tuned running gear. The first Golf GTI Cabriolet models will be delivered just in time for the official arrival of summer. XDS is standard, DSG optional. At launch, customers can specify either a 6-speed manual gearbox or 6-speed DSG (dual clutch gearbox) version. Both gearboxes send the power of the turbocharged petrol direct-injection engine to the front axle. At a low 1,700 rpm, the engine develops a maximum torque of 280 Nm, which stays constant up to 5,300 rpm – its torque curve has an ideal plateau and is actually not curved at all. To convert engine power into incredible forward propulsion, the Cabriolet is not only equipped with electronic differential locks (EDS) in its ESP system; the GTI Cabriolet also has the XDS transverse differential lock as standard. Even in full accelerations out of bends, the XDS system – also integrated in ESP – ensures optimal grip and driving stability. Strong cruiser. The Golf GTI Cabriolet accelerates to 100 km/h within 7.3 seconds in both gearbox versions. When the Cabriolet is driven with the roof up, its top speed is 237 km/h (DSG: 235 km/h). This contrasts with a combined fuel consumption of just 7.6 l/100 km, equivalent to CO2 emissions of 177 g/km (DSG: 7.7 l/100 km and 180 g/km CO2). An even better argument for the GTI among convertibles is the fact that the 2.0-litre sixteen-valve four cylinder is the ideal engine for cruising thanks to its high torque characteristic. Even while driving in a high gear with low revs, the Golf GTI Cabriolet still has plenty of reserve torque for acceleration. GTI insignia on the exterior. The convertible exhibits typical visual trademarks of the GTI. On the exterior, they are the red framing at the top and bottom of the radiator grille with its honeycomb structure and GTI signature, the front GTI bumper with a large air inlet screen (also honeycomb) and the typical vertically arranged fog lights, a new rear diffuser and chrome tailpipes on the left and right under the rear bumper. Similar to the GTI with a ‘permanent hard top’, this GTI also has dark-red LED rear lights, LED licence plate illumination and side sill extensions. The classic wheels on the GTI are the standard 17-inch ‘Denver’ type alloys with their five prominent openings, fitted with 225/45 tyres. Showing the same styling, but with a machine-polished surface and contrasting black inner surfaces are optional 18-inch alloy wheels for the Golf GTI Cabriolet – known as ‘Detroit’ (tyre size: 225/40). GTI interior styling. The interior of the new Cabriolet matches that of the classic GTI (except for a more raked windscreen frame and special rear bench). It also has sport seats upholstered in the classic and timeless tartan fabric (‘Jacky’), and leather seats (‘Vienna’) are available as an option. Integrated in the seats is a lumbar support, which is activated by a lever on the side of the seat. Naturally, this convertible also has pedals with brushed stainless steel caps, and a unique GTI gear shift lever in aluminium look; and of course a leather-trimmed steering wheel with grip recesses and a GTI emblem; and naturally the steering wheel, gear shift cover and leather trim of the parking brake lever have decorative red seams; and the interior lining of the soft top is black as are the trim covers of the roof pillars. All of these are typical GTI features. And so the decorative inlays in the doors and instrument panels are GTI-specific as well: in ‘Black Stripe’ – black, high-gloss accents in metallic look. Also standard: automatic climate control (Climatronic), chrome surrounds (e.g. around switches for the lights, electric windows, mirrors) and the RCD 210 radio-CD system. Summer in 9.5 seconds. The fabric top of the Golf Cabriolet, the basic construction of which was already designed for high speeds, was adopted 1:1 for the GTI. It is operated electro-hydraulically and takes just 9.5 seconds to open (and 11 seconds to close). The top may also be operated while driving at speeds of up to 30 km/h. When the top is up, this Volkswagen is one of the quietest convertibles available. 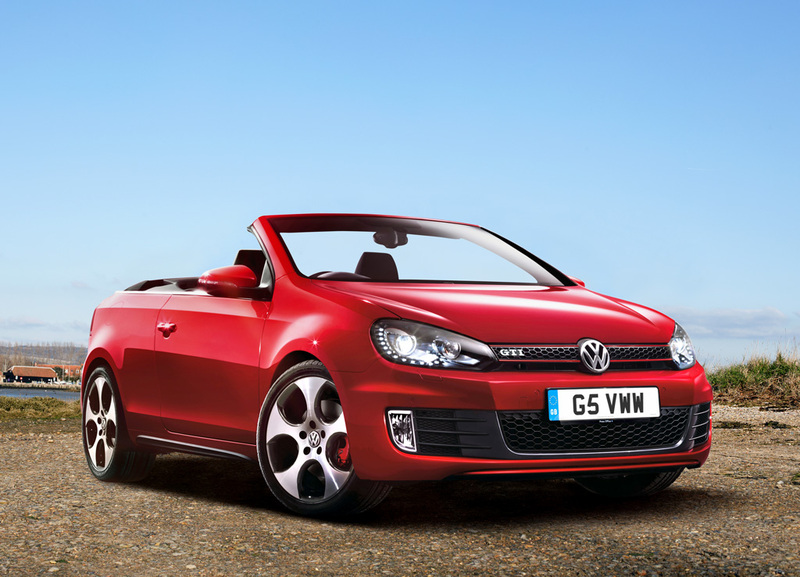 The Golf GTI Cabriolet also exhibits top quality and safety attributes. Automatically deploying roll-over protection, front and side head/thorax airbags and a knee airbag on the driver’s side are always standard. Last but not least, the Golf GTI Cabriolet offers the most spacious interior in its class and a fully usable boot (250 litres), even when the top is down. So, now there is no reason not to take a vacation in the Golf GTI Cabriolet.